If only American Muslim groups like CAIR and ISNA had shared the Qur'an's peaceful teachings with Ahmed Jabari, surely he would have chosen a life of peace and tolerance over a life of Jihad. GAZA CITY, Gaza Strip – Hamas officials in the Gaza Strip say an Israeli airstrike has killed the commander of its military wing. 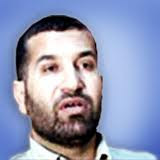 Ahmed Jabari becomes the most senior Hamas official to be killed since an Israeli invasion of Gaza four years ago. Jabari has long topped Israel's most-wanted list. Witnesses say Jabari was traveling in his vehicle in Gaza City when his car exploded. This man's last name is my first name. It's crazy. I was so elated when I read this !! Everytime I hear of this news...I think of one my favorite Queen songs! All is not lost for him, he's up there with his 72 virgins, if they exist but he has to collect his bits and pieces first. Israel has a right to exist and a right to defend herself! syria and iran are condemning the attacks from israel into gaza by calling it "barbaric attacks". looooooooooooool i just cant stop laughing after he has taken a break by coming to gaza after killing 40,000 people in his country!! Irony happens even in Israel. @Don You're right! About Syria and Iran: I'm wondering who's the barbaric one? A radical islamic Palestine with Hamas (terrorist group) that just Fired over 200 Rockets in the last two days all over Israel or a country that defend it's own citizen against terrorist attacks and suicide bombers that all they want is to die for the cause of Allah. With the double standard and lies (taqiyya) that Muslims do all the time, it's not surprising to hear guys like Mahmoud Ahmadinej, the President of Iran (funded Hamas) and Bashar Al-Assad, the President of Syria calling the defense attacks of Israel over Gaza as "barbaric" when in fact they are the oppressor, how ignorant but I can understand the irrational thinking of these presidents. Remember, the interview with Larry King on CNN with the President of Iran who don't believe that there ever was a Holocaust of the Jews in the WWII. About the death of Hamas chief, Ahmed Jabari, well I don't say that too often but Good Thing, one less threat to mankind. Hamas replied openly that they, Israel Just Open The "Gates Of Hell"
My question is: the gates of hell, is it Allah or perhaps Muhammad hidden behind these gates of hell?? If Israel wants to be like the U.S so be it , but don't treat Gaza without respect. Gaza desrve the right to exercise the religion of their own will ,which haapens to be Islam . @nickster: I can't tell if you're being serious. In what way should Israel show respect? In what way do they interfere with their religion? Do you mean building walls to stop suicide bombers? Responding with strikes on rocket locations shooting at Israeli citizens? Are you saying these (suicide bombing, terrorism) are part of Islam, and that Israel shouldn't interfere?